What's up with Italian 00 flour? What’s up with Italian 00 flour? Franco Berrino is probably the most well-known nutritionist in Italy and he has a big opinion about Italian 00 flour. Actually he calls refined 00 flour the “most dangerous poison humanity has ever seen.” Damn. Simply put, 00 flour is extremely refined flour made with only grano tenero (soft wheat). It is flour that has been milled and sifted as finely as possible and has had the wheat’s germ and bran totally removed. Franco Berrino likes to point out that people have only been consuming 00 Flour for the past 60 or 70 year, after high-yield milling was invented. These modern steel industrial mills were developed because they create a product that has a practicably never-ending shelf life. Berrino believes that that 00 flour is a poison, “not a poison that kills you with the first bite, instead it contributes to the increase of many chronic illnesses.” The extremely fine grinding of the wheat kernels makes the starch very easy to digest for the stomach’s enzymes which totally interferes with the body’s homeostasis. Experiments and studies show that the consumption of whole grains, instead, is associated with an important and significant reduction of obesity risk, diabetes death rate, cardiovascular diseases, cancer, respiratory and digestive system illnesses. 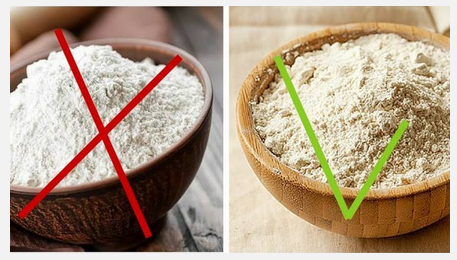 We have noticed that many of our friends in Italy have moved away from using 00 flour, even when baking cakes, crostate etc. Yes, it takes more skill to work with less refined flour, like our Pane Nero Flour or Semola Rimacinata, but,the flavor and health wins are real. Don’t forget, 00 flour is flavorless! Here’s a TV program where Berrino talks about the problems of 00 flour.